The Leadville 100 is by any measure one of the toughest and most popular ultra-marathons in the United States. More than 100 miles in the Rocky Mountains of Colorado, it crosses the 12,540-foot Hope Pass twice and grinds up a total of more than 15,000 vertical feet. This year, The North Face athlete Rob Krar won the grueling race in front of about 360 other finishers on August 16th. Krar finished in 16 hours, 9 minutes, and 32 seconds, the second-fastest time behind Matt Carpenter’s record of 15:42 set in 2005. 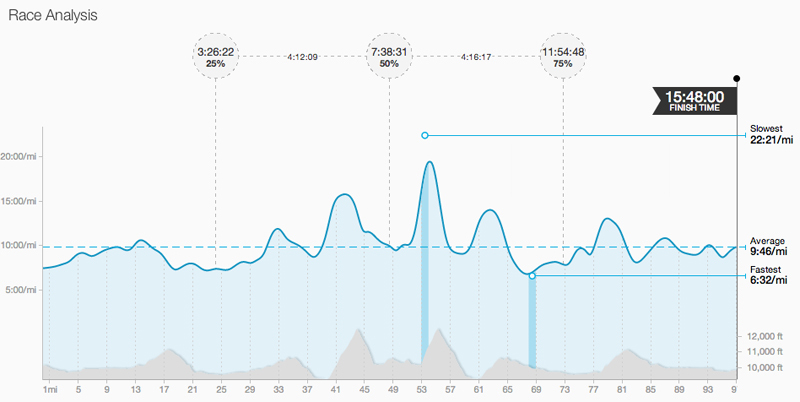 This graph shows Krar’s pace with elevation gain. Leadville’s no joke! For more fun details about the second-fastest Leadville 100 run in history, check out Krar’s Strava page (note: you’ll only see the details if signed in) and prepare to be amazed!